Best Small Rice Cookers - What Is The 4 Best One? You are here: Home / Best Small Rice Cookers – What Are The 4 Best Ones? Best Small Rice Cookers – What Are The 4 Best Ones? A small rice cooker is a better option if only one or two people are living in a household and you don’t expect any guests to eat with you for dinner. For example, my parents are the only ones who are living in their house. They do have a smaller stainless steel rice maker. It can cook up to 6 cups of uncooked rice. It is still big enough for the four of us to live with them for a week for now when we are visiting them. My parents usually don’t eat that much rice. When we are not there, my parents usually cook about 1 to 2 cups of uncooked rice. They used to have one that can only cook up to 3 cups of uncooked rice and it was a nonstick one. 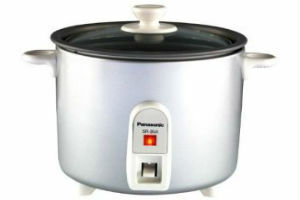 A very small basic and simple to use rice cooker is usually lower in price and it makes it possible to travel with you. My sister has done it a lot of times when she was on vacation. She usually cooks rice in the hotel for her meals. I guess she likes to save more money from not buying out. You can buy a rice maker as small as 1.5 cups of uncooked rice, but a 3 cups size is a better option if you have two people. It is really depending on the amount of rice each one of you consumes. In this post you will find 1.5 to 4 cup capacity cookers, and from having very basic cooking features to a lot more. The Zojirushi NS-LAC05XT model has a lot more cooking functions than the other ones. A little reminder, one cup of uncooked rice will usually yield you 2 cups of cooked rice, so select the right one that suits you. The following rice makers are my favorite ones to buy. If I ever need a smaller one, one of those will be it, but it won’t be for a while since my kids are still growing. I don’t mind having it with me for traveling alone or with my husband. I’m most likely to go with the one that can cook up to 3 cups instead of the 1.5 cup. Usually the less cups of rice you need to cook, the less time it needs for cooking. The 1.5 cup is the smallest one I can find. I don’t think there is any smaller one than that. It looks kind of cute when it is small and it takes less counter space. It will make a great gift for someone who is living alone in an apartment or for your son or daughter living in a dorm. That way your kid will have a choice to either make meals or buy out. This one is super simple to use and it will encourage them to cook more to save more money, especially college students who are on a tight budget. The inner pot is coated with a nonstick for easy cleaning. It comes with a measuring cup and serving ready cooked rice spatula. It uses only 200 watt power. If you are a truck driver or traveler, it will be great to use it with a small power inverter. Buying meals all the time on the road, your bill will add up pretty fast. It is not recommended to be used for cooking brown rice. You should wash the rice in a separate pan and not in the included cooking inner pot. The lid or cover is made with glass, so it is easy for you to monitor the rice cooking status. It will shut off by itself when it is done cooking. Note: It is not compatible to be used in other countries, like United Kingdom or Australia. The plug won’t fit the outlet. It is designed to be used only in the United States. If you are from other countries, then you shouldn’t buy it or else you won’t be able to use it. People who bought the Panasonic SR3Na model are very happy with their purchase. Some wish they had bought it sooner. Pros: It is very easy to use and clean up. Rice cooks very fast and doesn’t burn on the bottom. It automatically turns off when it is done cooking. Cons: It doesn’t have a keep warm function for the rice. When the rice is done cooking, it will automatically shut off. You really don’t need the keep warm function if you eat it as soon as it is done. It is very small. You won’t have any rice left to keep it warm for later, but it is a good idea to have it though. Some are saying it is too small for them. Seriously, this one is more for one person only. If you need the keep warm function, you might want to get a different one that has it. If the 1.5 cup one is not big enough for you then you might go with this one with the capacity of 3 cups of uncooked rice made by the very popular brand of Zorjirushi. It uses 120 volts or 300 watt power. It’s a little more than the above one of 1.5 cups. The inner pot is a nonstick and the body of the cooker has two stay cool handles for easy carrying to a different location, like the serving table with the rest of the dishes. That way you don’t have to walk back for refilling the rice. I think this is more for a family of 2 to 3 people. 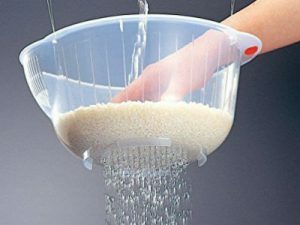 If you need a bigger size of this model, you can select the other available two sizes of 6 to 10 cups of uncooked rice. This one also has a see through glass lid with a stay cool knob but doesn’t have the keep rice warm function and the stainless steel steamer tray, but the 6 and 10 cups have the keep warm function with an included removable stainless steel steamer tray. I guess the manufacturer is thinking the 3 cups one doesn’t need the keep warm function since it produces not a lot of cooked rice, but I think they should add the keep warm function since sometimes we can’t eat the rice at that very moment when it is done. The cord for the NHS-03 model is mounted to the rice maker and it can’t be detached. It does provide you with the measuring cup and nonstick spatula. Thought you might like to know about this, according to the manual, you can actually use this model to cook brown rice. It tells you how much brown rice and water level to put in it. The maximum cups of uncooked brown rice you can make is 2. It is one cup less than the white rice and be sure NOT to forget about that. If you decided to buy this model please do not over fill or put too much water or else you might have a lot of mess to clean up. Only use the designated amount of water and rice. This item has been out on the market for about 16 years already. It has been around since the year 2000 and the average rating for this model is pretty good by the users, and it is still maintaining its happy rating. If a product is bad it wouldn’t take that many years to find out. It only takes several months to find out by the consumers. Pros: It is light weight, easy to use and clean up. Cooks really good white rice and can even make brown rice. Cons: This one is also about NOT having the keep warm function. Do not confuse on the sale page with the other two models of the NHS-10 and NHS-18. They have a few more features when comparing to the NHS-06. At first I also thought the NHS-06 had the keep warm function but when I did a little more research I found out it doesn’t have it. Here is another one made by Zojirushi. This one is a more high end product when comparing with the other ones. It can cook up to 3 cups of uncooked rice and yields up to 6 cups of cooked rice. The body of this one is made with stainless steel and the inner pot is coated with nonstick for easy clean up. This one is almost like the mini version of the Zojirushi NS-TSC10. It comes with a measuring cup, nonstick spatula and a spatula holder. It is very lightweight and small. It doesn’t take that much kitchen space and it is easy to move around. Click the following hyperlink to read an in-depth review of the Zojirushi NS-LAC05XT. If the other ones are a little small for your family maybe this one is a better option. 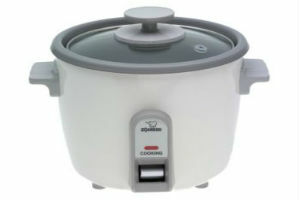 You can use it to cook up to 4 cups of uncooked rice and it will yield 8 cups of cooked rice. 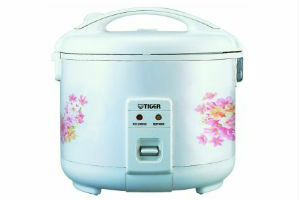 This rice maker looks pretty nice with a flower design on the body. This one has a keep warm function of up to 12 hours and two indicator lights. One is for cooking and the other is keep warm. It is very easy to use. Requires only pressing the cook button and it will be on its way to making your yummy rice for dinner. The inner pot is also a non stick with included measuring cup and spatula and spatula holder. It uses about 340 watt power. The cord is retractable for easy storage when it is not in use. This one is manufactured in Japan and not your usual place from China. 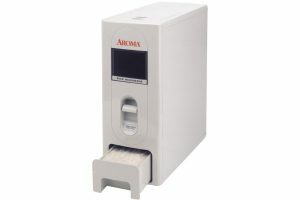 The price might be a little higher to me when comparing with other rice makers since it isn’t built with that many functions. Well, maybe it is because it is made in Japan. The average rating for this one is much higher, but there are about 9 to 10 percent of users who give it a bad rating. Well, almost every product has some kind of bad rating. I don’t think there is an item that is perfect. Those rating numbers look very good to me. Sometimes when you are buying a product, it will have to depend on your luck to not get a defective one. It is a pain when that happens. Pros: It looks lovely, easy to use, cooks really good fluffy rice and it works as it claims. 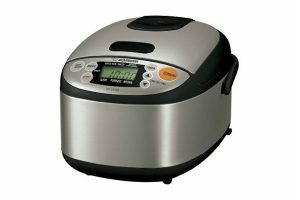 Cons: Some users are complaining this rice cooker doesn’t last that long and the product control quality is poor despite it being made in Japan, and the price is not worth it. If you have an item that is not working after the returning period then contact the manufacture to repair it. A product usually has a year warranty.